Today I tackled the issue of what to do with the nearly 17 pounds of cherries left from our cherry-picking adventure of yesterday (see post below). John had a shoot today, so after having a breakfast of – what else? – cherry pie, he headed off to be a Manly Man Doing Manly Things, leaving me with all those cherries. At least they were pitted. 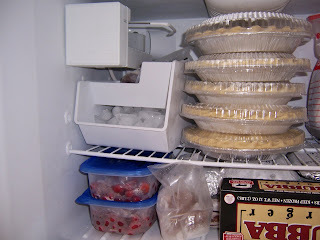 The first thing I did was make room in my freezer for the pies. Hmm – the remnants of that Easter ham can be thawed out for sandwiches, and it’s about time I used this Tupperware container of chicken curry. And that can go there, and that can go there… Finally I reckoned I had enough space for five pies – no more. Uh oh. 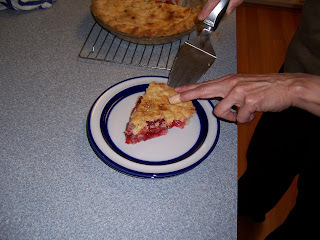 Next I made a double recipe of piecrust and put it in the refrigerator to chill. I toyed with the idea of tripling or quadrupling the recipe but fortunately common sense intervened; it’s hard enough to cut in all that butter and shortening in a double batch. I was also nursing a knife cut from the day before (note bandage on finger in photo) – I am the only person I know who can cut herself badly with a butter knife. The sad thing is, I’ve done it before, trying to scrape a stubborn mussel out of its shell. About an hour later, I put together a double batch of the cherry pie filling and made two pies. I was careful to keep all the trimmings of unbaked crust, as I was fairly certain I would have enough to make another crust when I was done. I really hate using those tin pie plates to make a pie – they’re flimsy and tend to scoot around the counter when you’re putting the bottom crust in – but I only own two pie glass pie plates and they would have taken up too much precious freezer space. At least the tin plates come with plastic covers – both a bottom and top cover. I repeated this process, resulting in two more pies and enough crust trimmings to make to make the fifth and final piecrust. Then I fought with the plastic covers (why do they give you three sets of covers for two pie pans? ), which did not want to snap down securely, and which make the stacking of the pies a little dicey. But at last they were all in the freezer, and I decanted the remaining cherries into plastic containers. I’m guessing I have enough cherries for one more large pie, or maybe just a cobbler. I also have a little patty of raw pie dough left to make decorations on the frozen pies when the time comes to bake them (just let them thaw in the refrigerator, then bake at 400 degrees for 50 minutes). So that’s the end of the weekend’s Great Pie Adventure. I have a freezer full of cherry pie and have no idea how the two of us are going to eat them all (when I made noises about giving one or two away, John became positively Cartman-esque), but I expect by the time we finish the last one off, we’re going to be fairly sick of sour cherry pie. Right about the time apple-picking time rolls around, I bet.